In a recent win with one of the largest paint manufacturers in the U.S., Hardy Process Solutions’ dynamic checkweighers were able to meet customer connectivity and data requirements with its open-source approach by delivering equipment that not only easily integrates into the factory control system, but also produces precisely the data set the customer was seeking. 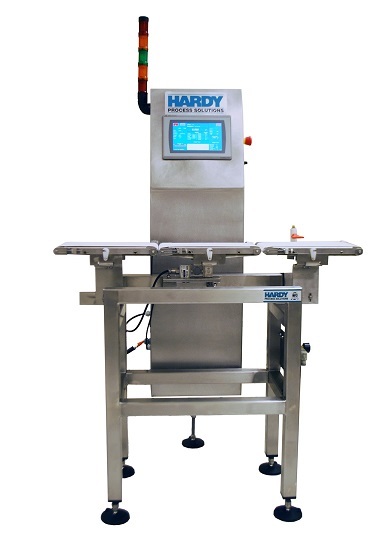 Hardy continues to meet unique customer needs with its open source controls approach for its checkweigher machinery. Built on a Rockwell Automation platform and using Hardy’s HI4050CW controller, the dynamic checkweigher series delivers high performance and ultimate flexibility for current product inspection needs in a wide variety of manufacturing or processing plants. Hardy provided these capabilities to the customer all without modification to the equipment software. The dynamic checkweigher series is a fully automated system designed to automatically weigh items while in motion. The checkweigher controller can communicate both upstream and downstream across Rockwell Automation’s The Connected Enterprise. Machine control, statistics, and analytics are managed with an integrated Rockwell Automation CompactLogix PLC, while the high-performance Hardy HI 4050CW checkweigher controller contributes as a co-processer, generating fast, stable, and accurate weigh data. The resulting high-speed check weighing system can process up to 350 pieces per minute and generate a myriad of process data that is easily shared with any other device on The Connected Enterprise Network. Flexible and highly accurate, the dynamic checkweigher weighs products of virtually any shape or size in containers such as boxes, cans, bottles, rigid shrink-wrapped packages, or flexible packages. Items compatible with the system include bagged and boxed sugars, raw meats, fruits, vegetables, chemicals, fertilizers, and consumer packaged goods.